It's almost time for Ice Cream For Breakfast Day! If social media has taught us anything, it’s that the year is full of unofficial “holidays.” And while it’s always pleasant to realize it’s National Chocolate Day or Siblings Day, other special occasions ― like Fruitcake Toss Day or Yellow Pigs Day ― are less familiar and seem a little tougher to celebrate. We looked at sources like Chase’s Calendar of Events, the annual super-calendar of special observances and holidays, to identify some of the most unusual occasions. Many have gone global despite starting off as national, local or even family-specific traditions. Without further ado: Here are 21 strange and mostly unofficial holidays, plus the stories of how they came to be. Newsletter specialist Jeff Rubin created National Punctuation Day in 2004 to promote and celebrate correctly placed semicolons, periods and ellipses. His wife, Norma, apparently got tired of hearing him complain about seeing punctuation being misused, so she encouraged him to do something about it. Rubin supports the Oxford comma. This day is dedicated to not taking responsibility for any of your failings. Anne Moeller of Clio, Michigan, reportedly created the holiday in 1982. Legend has it that her alarm didn’t go off one Friday the 13th, which caused her show up late for appointments ― and make excuses ― throughout the day. 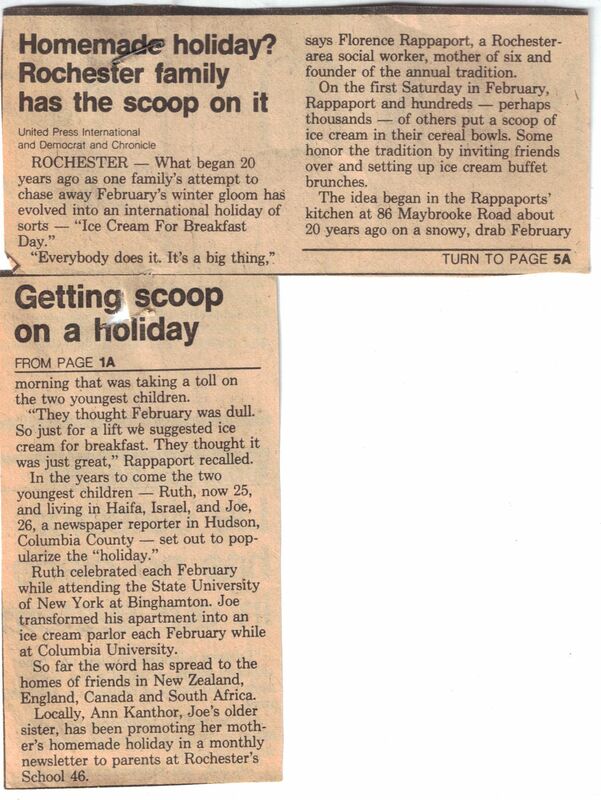 Florence Rappaport of Rochester, New York, started Ice Cream For Breakfast Day in the 1960s. “It was cold and snowy and the kids were complaining that it was too cold to do anything. So I just said, ‘Let’s have ice cream for breakfast,’” the mother of six told The Washington Post. Her two youngest children reminded her of the special day every year after that, and spread the family tradition when they went to college. 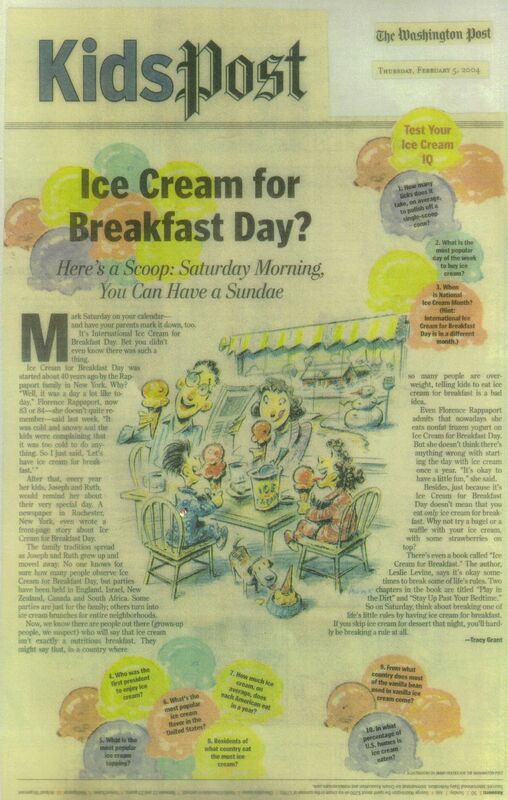 Ice Cream For Breakfast Day became the subject of newspaper articles around the world, with celebrations taking place in Israel, New Zealand, England, Canada and South Africa. Jacki Milgate pitched the idea of Kiss And Make Up Day to Chase’s Calendar of Events, and the holiday appeared in the publication’s 1992 edition. She chose Aug. 25 because it’s her birthday. Oregon pals John “Ol’ Chumbucket” Baur and Mark “Cap’n Slappy” Summers created Talk Like a Pirate Day on June 6, 1995, after, for reasons they don’t quite recall, they started using pirate-speak during a game of racquetball. Out of respect for the fact that June 6 is the anniversary of D-Day, they chose to designate Sept. 19 (the birthday of Summers’ ex-wife) as Talk Like a Pirate Day. “For seven years we celebrated International Talk Like a Pirate Day pretty much on our own, with our friend Brian Rhodes actually reminding us that the event was coming up,” Baur and Summers wrote on their holiday’s official website. In 2002, they reached out to humor columnist Dave Barry to share their tradition, and he wrote a piece about it. Talk Like a Pirate Day has since gained a cult following, with individuals and businesses taking part in the fun. This squirrel-themed day was the brainchild of Christy Hargrove, a wildlife rehabilitator from North Carolina who was affiliated with the Western North Carolina Nature Center. Hargrove invented Squirrel Appreciation Day in 2001 to celebrate squirrels and educate people about the species. You can celebrate the occasion by putting out food for squirrels, reading about the animal or observing them in person. Dog trainer Ami Moore created Hug Your Hound Day (reportedly in the late 1990s) to strengthen the relationship between dogs and their owners. The Duchess Who Wasn’t Day celebrates the life and work of Irish author Margaret Wolfe Hungerford (1855-1897), who wrote under the pen name The Duchess. According to lore, a 7-year-old British girl named Dorie Cooper was the inspiration for Draw A Bird Day. In 1943, her mom took her to the hospital to visit her uncle, who was distraught over losing his leg in the war. She asked her uncle to draw her a picture of a bird, so he drew a robin. She laughed at his bird drawing but said she would hang it in her room. Dorie’s “complete honesty and acceptance” lifted her uncle’s spirits, and the story cheered up other soldiers in the hospital. Soldiers held drawing contests whenever she visited, and over time the ward was covered in bird art. Dorie was hit by a car three years later and died. Her coffin was reportedly filled with bird pictures drawn by soldiers, nurses and doctors from her uncle’s ward. They honored her every year on her birthday, April 8, by drawing birds, and the tradition grew as a way to help soldiers find joy and forget the suffering of war. This holiday originates from an episode of the 1970s sitcom “Three’s Company,” in which the character Larry Dallas declared it to be “Wear Something Gaudy Day.” Because of that, Oct. 17 is a great day to dress in your loudest, flashiest, tackiest outfit. Yellow Pigs Day supposedly dates back to the early 1960s, when Princeton University math students Michael Spivak and David C. Kelly were exploring the properties of the number 17. At some point, they got a little loopy and thought up the idea of a yellow pig with 17 toes, 17 eyelashes and 17 teeth. The association of the number 17 and a yellow pig lived on. Spivak reportedly makes subtle references to it in his writing, and Kelly gives an annual lecture on the number 17 as part of the Yellow Pigs Day celebration during the Hampshire College Summer Studies in Mathematics for high-ability high school students. He also has an extensive collection of yellow pigs. Caps Lock Day relates to ... yep, you guessed it, the caps lock key on a computer keyboard. Derek Arnold of Iowa created the holiday in 2000. Caps Lock Day was originally celebrated on Oct. 22, but Arnold later added a second day of observation: June 28, the day in 2009 that infomercial king Billy Mays died. Some people jokingly refer to the caps lock key as the “Billy Mays” key because of his famously loud voice. According to superstition, opening an umbrella indoors will cause bad luck to “rain down” on you. A gentleman in Maryland named Thomas Edward Knibb apparently thought this was a load of B.S. Knibb reportedly invented National Open An Umbrella Indoors Day in 2003 as a way to defy the superstition. He encourages people to open their umbrellas inside and realize that nothing bad will happen to them. It should go without saying, but you’re meant to celebrate Working Naked Day by working from home. Home office expert and author Lisa Kanarek created the holiday in 2011. “Working Naked Day is about celebrating the freedom you have to work from home and enjoying a sweet arrangement that allows you to spend time with your family, set your own hours, and say goodbye to your boss and annoying co-workers,” she wrote on her website. DeSimone encourages people to celebrate by using lots of ampersands, substituting ”&” for “and” wherever possible, designing new styles of ampersands and replacing syllables and parts of friends names with ampersands ― like &roid, c&elabra, Gr&ma, and Alex&er. The first Be Kind To Lawyers Day took place in 2008. The unofficial holiday is the brainchild of Steve Hughes, “a mild-mannered non-lawyer from St. Louis, Missouri” who worked with lawyers on their presentation skills ― a job he enjoyed very much. Hughes eventually decided to create a special day to honor lawyers. He chose the second Tuesday in April because it falls between April Fool’s Day and Tax Day. The exact history of this holiday is unconfirmed, but many people believe Fruitcake Toss Day originated in Manitou Springs, Colorado, as a way for people to get rid of unwanted fruitcake after Christmas. The town held an annual “fruitcake toss” beginning in 1996. The annual event used to take place on one of the first Saturdays in January, but the date has been pushed back in recent years and many calendars recognize Fruitcake Toss Day as Jan. 3. Given there seems to be an occasion to honor every single day of the year, Nothing Day comes as a relief. California entrepreneur Lance Hardie invented Plan Your Own Epitaph Day while working as a special events producer for KHSU radio in 1995. He submitted the event to Chase’s Calendar of Events, which printed it in the next edition. The occasion occurs on Nov. 2 (the Day of the Dead) and April 6, which is around the time of China’s Ching Ming Festival (an occasion to visit graves and burial grounds to pray to your ancestors). As the name suggests, Plan Your Epitaph Day encourages people to think about what will go on their tombstones after they die. Adrienne Sioux Koopersmith, who bills herself as “America’s premier eventologist,” reportedly created this holiday so people could give themselves a break from projects involving a great deal of thought or analysis. Pretend To Be A Time Traveler Day originates from the now-defunct Koala Wallop forums. The online community established the special day and set the ground rules in 2007. Participants must spend the entire day portraying a character ― costumes and all ― that can come from the past or the future, dystopian or utopian. People honoring the holiday can’t tell anyone they’re a time traveler.